The purpose of this publication is to assist Member States in developing comprehensive contingency plans for computer security incidents with the potential to impact nuclear security and/or nuclear safety. 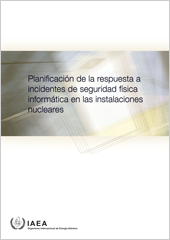 It provides an outline and recommendations for establishing a computer security incident response capability as part of a computer security programme, and considers the roles and responsibilities of the system owner, operator, competent authority, and national technical authority in responding to a computer security incident with possible nuclear security repercussions. IAEA-TDL-005, 66 pp. ; 4 figures; 2018, ISBN 978-92-0-306717-1, Spanish. 18.00 Euro. Date of Issue: 2018-05-28. Full Text, (File Size: 1484 KB). Subject Classification: 0600 - Nuclear and Radiation Safety; 1400 - Physical protection of radioactive material.